Venezuela is in freefall. Food and medicine shortages, power cuts and hyperinflation are driving millions of Venezuelans out of the country, creating a new stream of refugees fleeing their once rich, glamorous and prosperous land. It’s as if this oil-rich nation has been infected with a terminal disease. Its name? Socialism — that death dealing ideology that all the popes of recent memory have warned against, beginning with Pope Pius IX in 1849. In his encyclical, Nostis et Nobiscum. delivered after the publication of Marx & Engels’ ground-shaking pamphlet The Communist Manifesto in 1848, Pius warned of the consequences of adopting its atheistic theories. The truth of his words has been confirmed repeatedly as countless nations since then, disregarding his advice, have taken on the yoke of socialism to varying degrees and suffered its consequences. The latest victim is Venezuela where this wasting disease was first introduced by Hugo Chavez, a former military officer who launched an ill-fated coup in 1992, and was then elected president in 1998 on a populist platform. As a candidate, he railed against Venezuela’s elites for widespread corruption, and pledged to use the country’s vast oil wealth to reduce poverty and inequality. During his presidency, which lasted until his death in 2013, Chavez expropriated millions of acres of land and nationalized hundreds of private businesses and foreign-owned assets, including oil projects run by ConocoPhillips and ExxonMobil. And the Venezuelan economy headed south. This was largely because of Chavez’s theft of private property, so typical of socialist doctrine, which invariably leads to the collapse of national wealth and exactly the sort of impoverishment that every pope before Francis has warned against. Chavez – the Venezuela-born revolutionary channelling Simon Bolivar of the nineteenth century – aimed to align Latin American countries against the United States. Which is why he headed the formation of ALBA, a bloc of socialist, leftist Latin American governments, and established the Petrocaribe Alliance in which Venezuela promised to export petroleum at discounted rates to 18 Central American and Caribbean states already crippled by the same ideology Chavez was using to deform his own country. And he did this while expanding the powers of his presidency and reducing civilian control over the military. Then, in 2009, Chavez led a successful referendum, ending presidential term limits and transforming his government into a dictatorship. Which, when Chavez died in 2013, Nicolas Maduro took over, pledging to continue the socialist revolution of his boss whom he called Venezuela’s “eternal father”. Six years later, as Maduro begins another six-year term, Venezuela is in ruins. So much so that by late 2017, the country owed $150 billion to foreign creditors while holding just under $10 billion in reserves in an economy marked with soaring inflation and severe shortages including food, soap, toilet paper and 85% of medical supplies unavailable. This has led to the reappearance of diphtheria and malaria, and a steep rise in infant and maternal mortality rates. Poverty has also spiked, exacerbating Venezuela’s rising levels of violence and producing its highest-ever homicide rate, along with increased malnourishment among school-aged children. Little wonder then that the thousands of Venezuelans who began fleeing into Colombia, Brazil and elsewhere three years ago have now turned into millions at the most recent estimate. All fleeing from the very Socialism that Leo XIII (1877-1903) warned would not improve their society but overthrow it entirely: “The harvest of misery is before our eyes, and the dreadful projects of the most disastrous national upheavals are threatening us from the growing power of the socialistic movement,” wrote Leo in Graves de Communi Re, 1901. Now, as then, little has changed. “They have insidiously worked their way into the very heart of the community, and in the darkness of their secret gatherings, and in the open light of day, in their writings and their harangues, they are urging the masses onward to sedition; they fling aside religious discipline; they scorn duties; they clamor only for rights; they are working incessantly on the multitudes of the needy which daily grow greater, and which, because of their poverty are easily deluded and led into error,” Leo continued in Graves de Communi Re. Tell that to New York’s youngest congresswoman, Alexandria Ocasio-Cortez, the vehement 29-year-old socialist apparently unaware of Leo XIII’s teaching. And yet, she credits her Catholic background for her devotion to what she calls “democratic socialism”. Little does she seem to realize that it was the Catholic Church which has denounced Socialism, along with Liberation Theology, since their first appearances on the world stage. Just as Pope Leo repeatedly reminded the world in other encyclicals of the peril it poses not only to their temporal possessions, but also to their morality and religion. 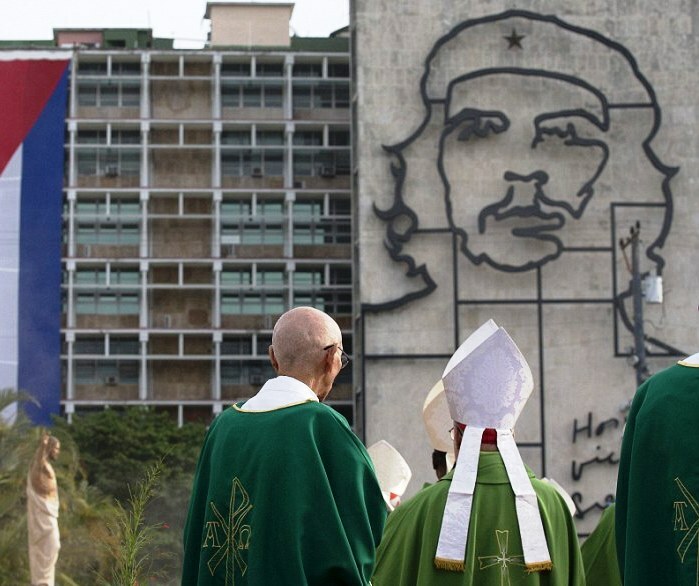 Which raises this question: How is it that several generations of Catholics in so many countries have decided that socialism is harmonious with Catholicism? Particularly when the Church has consistently and repeatedly warned that socialism endangers not only the faith, but family? Yet despite the fact that the current economic and societal unrest in Venezuela and nearby Nicaragua can be traced to socialism – which has always been destructive to families and their livelihoods – its contemporary advocates remain unmoved. Why? Perhaps Pope Leo provides the most overarching answer: socialists are utopians. Which indeed their promises have done and still do, as they did in the Russian Revolution, the Stalinist purges, the holocaust of Nazism (National Socialism) in Europe, the Cultural Revolution in China and the atrocities of the Khmer Rouge in Cambodia and various other utopian revolutions around the world, including in Cuba. Yet this eternal truth – as expressed so profoundly by Pius XI in 1931 — is unlikely to persuade Maduro or Ocasio-Cortez or any other deluded individual who imagines that the two can be reconciled. They cannot. This is why the rising popularity of socialism, particularly among the young – and its ongoing successes at the ballot box – should be so concerning. Young people are susceptible to its siren appeals for “education for all” and “Medicare for all”. And Ocasio-Cortez strongly represents her age group, many of whom have almost no knowledge of history and have been taught only socialism as the one and only political solution to the human condition in a post-Christian world. Nor do they seem aware that socialism robs the very people they profess to care about of their individual dignity and human rights. It is here that the contrast between Christianity and socialism stands out most clearly. From the Christian perspective, rights come from God. They are intrinsic to human nature; they can neither be taken nor bestowed by others. In the socialist philosophy, however, rights are conferred by and subject to the State. This makes the individual not a citizen but a slave of the State, whose value is determined by the State – a fact which bothers socialist ideologues not at all. Meanwhile, Venezuela under Maduro continues to deteriorate, while the media takes little notice, one supposes, because the dire condition of this South American nation discredits their favourite ideology. An ideology shared, it seems, by presidents Miguel Diaz-Canel of Cuba, Evo Morales of Bolivia and Anatoli Bibilov of a breakaway province of Georgia who were among the few foreign leaders who attended the recent Maduro swearing-in ceremony at Venezuela’s Supreme Court. Also among the few attendants of Maduro’s inauguration was a Vatican representative sent by Pope Francis just one day after the nation’s bishops declared the Maduro presidency “illegitimate”, thereby creating an uncomfortable diplomatic incident. While many countries – including the U.S. and most nations from Latin America and Europe – boycotted the inauguration of the Venezuelan dictator, the Vatican sent Polish Monsignor George Koovakod to attend the event, an act which did not escape Maduro’s attention, and for which he thanked the prelate for his “courageous” presence at the event. The newspaper also reported that another prelate, Bishop Antonio Lopez Castillo of Barquisimeto, had drawn cheers from thousands at a Mass when he asked that Venezuela be saved from corruption. Last May, Maduro declared himself the winner of the election against a fellow socialist after banning opposition parties from taking place in the election and imprisoning or exiling his strongest adversaries. Thus, the election was widely dismissed as fraudulent and marred by record low turnout. Meanwhile, as Venezuela’s oil output – once among the world’s largest reserves – plummets to less than a third, critics blame years of rampant corruption and mismanagement of the state-run oil company PDVSA for the country’s economic collapse which has thrown the nation of 30 million people into turmoil. It has also been forecast that in 2019 the Venezuelan economy will continue to contract and inflation will skyrocket at a staggering 23 million percent, says Francisco Rodriguez, a former Venezuelan official now chief economist at New York-based Torino Capital. Plus, as an estimated 2.3 million Venezuelans have already fled, according to the United Nations, those remaining live on a monthly minimum wage equal to less than $5 and falling daily. And there’s little hope of relief as Venezuela’s splintered opposition movement, whose leaders have been jailed or driven into exile, has failed to counter the socialist party’s dominance. This is exactly the solution echoed by Brazil’s new president, Jair Bolsonaro, whose Catholic faith many Brazilians are convinced has been instrumental, not accidental, to his electoral victory and to the wave of change now washing over Brazil which has been stagnating for so long in an ocean of government corruption. The new president noted the catastrophic effects of the collapse of moral values that has occurred in recent decades in his country under socialist rule – exemplified by the promotion of homosexuality and gender ideology in government-funded parades and in public school indoctrination – along with the massive surge in crime in recent years. No surprise then that so many Venezuelans, most baptised Catholics, are heading for Brazil. “Well, in Brazil, now we do,” retorts Araújo. And that’s what is so likely to make all the difference, a difference Venezuelans are currently being denied.